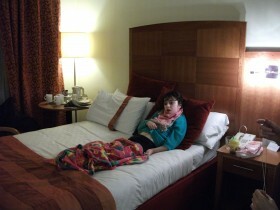 A one night stop over at the Holiday Inn in Nottingham City Center turned out to be a wonderful experience. I got us a room which had two double beds and included breakfast, the room let us take Paige and Imogen along with us and children under 13 years eat for free, the room was really very nice, far better than we expected. The staff on check in could not be more helpful, they made sure we had plenty of towels and drinks for the children. When in our room I found a leaflet telling us that if we ate at the hotel that evening we would also get an extra 20% of all food and drink, so we booked for dinner, down in the resturant we found they had a special 3 course menu on for £15 so we thought that would do nicely, the children had a wonderful menu of their own, with things such as half a roast chicken on, not just nuggets and chips. John and I both thought we had one of the best hotel meals we have had in years, excellent is the word to use and the big plus was that the children had free meals as well, our total bill for the evening with drinks and coffees came to £30 which covered all four of us, we felt was real value for money. next morning the breakfast again was fantastic, terrific choice and all beautifully cooked or laid out out. We would recommend this hotel to anyone and intend to use Holiday Inn again.